The popular Quail is a favorite of game bird breeders, hunters and bird lovers alike. Just about everyone is familiar with male's call for which the species is named. These plump little birds have the most widespread range of any quail species, with over 20 supspecies ranging from Canada to southern Mexico. They have also been introduced abroad, to such places as Hawaii and New Zealand, as a game species. Commercial game bird farms raise thousands each year for release in the US and Canada. Of the subspecies, the Eastern Bobwhite (C. V. Viriginaus), is the most often kept and seen. They are found in a variety of habitats, from open woodlands & fields to suburban parks. Those with bird feeders in their yards are sometimes greeted a few quail who come to feed on the seed that is dropped by the other birds. Males have a white throat and eye-line, with a dark crown and a black line that seperates the white on the throat to the eye-line. The lower breast is mottled white & dark brown; sides have light brown streaks and the back and rest of the body mottled brown overall; tail gray. The hens are similiar, but her throat and eye-line is buff and her overall color is somewhat lighter. They form large groups during the winter called coveys. These coveys can consist of up to 30 or more birds and when disturbed, all will burst into flight at once. They are popular with breeders in captivity, but remain on the Endangered Species List in the wild. 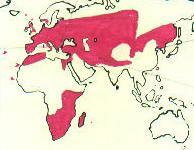 These birds are similar to the eastern race, but males have a very dark face & throat. They also appear darker overall.The further south you travel into Mexico, the Bobwhite subspecies differ a great deal from the northern counterparts. Many have much more white on the throats and a more detailed barring on the breast. It is a shame that some of these races have yet make their way to our aviaries, as they are beautiful birds. Perhaps in the future, some may make their way and become established in captivity. Bobwhites present no problems in captive rearing, and can be produced easily in modest surroundings or large aviaries. Many producers house their breeders in breeding batteries, some as small as 1'x1'x1' and keep them in trios or pairs. These batteries are designed to allow the keeper to feed, water and gather eggs (sloped flooring) without entering the cage. We have had success keeping our quail in larger wire bottom cages, usually about 2'x3'x2' with roosts and material for nesting. We also kept a pair in large flight aviary with other birds one year and they did very well. You can choose to colony mate (several hens with two or three males), trios (one male with two hens) or in pairs. Bobwhite hens begin laying in mid April and may lay all summer long. The eggs are pure white and are incubated for 21 days. You will probably have to use artificial incubation with this species, as many captive hens are mass producers of eggs are highly unlikely to go broody in a cage setting. Bobwhites are also induced into laying earlier than normal using artificial light. Some larger farms also use the lights to have hens produce eggs year round. Chicks are easy to raise in the brooder. They require a high protein diet and lots of room, as they are very active and prone to picking if overcrowded. The chicks are kept in a brooder setting for about six weeks, then they are moved to covered, outdoor enclosure. As mentioned, Bobwhites are easy to keep and raise. They are often one of the first species of quail for the beginning quail breeder and many long-time breeders keep them around for the male's call. Like many other species of quail, they seem to do best on wire, but can be kept on the ground if the aviary is well-drained. During the Winter, birds that are not kept indoors such as a barn, should be grouped together so they can form natural coveys for warmth. I also recommend keeping dry straw or hay in the cage during the Winter. Bobwhite should be fed a good quality game bird ration of at least 16% protein during the non-breeding season to 20% during the laying period. I also supplement their diet with various grains, greens and mealworms. There have been a number of mutations developed in captivity. Some of the popular colors include the Mexican Speckled, the Tennesse Red, White and Silver Bobwhites. There are also strains developed for their large size, such as the Wisconsin Jumbo and the Indiana Giant. I will add a more complete description of the mutations and perhaps another page for them at a later date. 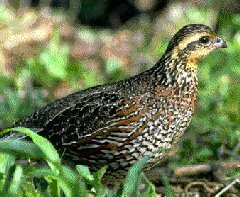 Care and breeding of the various mutations is the same as the normal Bobwhite. Button Quail, also known as the Asian Blue Quail, Blue-breasted or King Quail, are found from India and southern China south through Indonesia into New Guinea and northeast Australia in 10 subspecies. It is believed that most birds in US aviculture are from the nominate subspecies, C. C. Chinensis. There are also many color mutations that have been developed in captivity. Little is known of their habits and status in the wild. As seen in the photograph to the right, males are overall dark brownish-blue with a white and black face and throat. The breast is lighter bluish-gray, with a chestnut-red belly. The feet are yellow, bill is black. Hens are mottled brown overall and lack the white and black markings on the face and throat. Button Quail are easy to raise in both cages and aviaries. They will breed year-round if kept under lights. In larger cages or aviaries, one can allow the hen to set and incubate her own eggs. Since the chicks are so tiny, ensure that the wire has some type of barrier or protection to keep the chicks from escaping. They are able to squeeze through 1/2 inch hardware cloth!! Incubation period is 16 days and the chicks grow quickly. You will need to make sure the waterers for the chicks are small or place some marbles in the fount to make sure they do not get in and drown. The marbles also encourage the birds to drink and find the water, as they are attracted to the shiny colors of the marbles. As mentioned, you can house these little birds with a number of cage birds. Our breeders are currently housed with Zebra Finches and Weavers. They feed on a mixture of finch diet and game bird breeder mash. They are supplemented with mealworms, spray millet and various greens. The most common of the mutations, and perhaps the first developed, is the Silver. Silvers are marked like the wild type, but the overall color has been replaced with a light gray or silver. Another common mutation is the White, which is completely white with no markings.